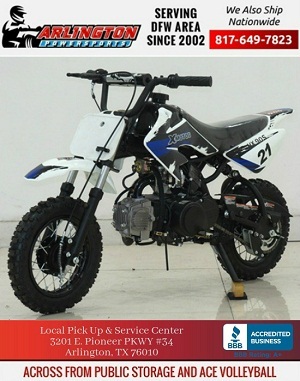 Are you planning to buy pit bike online for your kid? But you are getting confused with the dirt bikes? 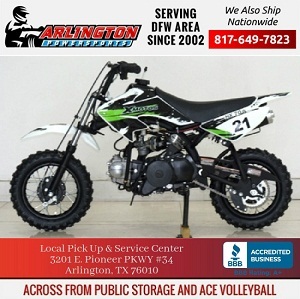 Then to help you with this we at Arlington PowerSports are providing you with a brief comparison between a pit bike and a dirt bike. Firstly, a pit bike is a small-sized motorcycle used for riding in pits and pit racing by kids whereas a dirt bike is engineered for using it on the streets and harsh terrains. Secondly, pit bikes are equipped with a four-stroke engine that makes it less powerful which allows these vehicles to limit their acceleration and speed. On the other side, dirt bikes have two-stroke engines that enable the riders to drive their bikes at a higher speed. Although, a four-stroke engine limits the acceleration, but it is more powerful and fuel efficient. In case of dirt bikes, the engines are placed at higher positions to avoid stumbling on uneven surfaces. Thirdly, pit bikes have a short body as compared to the dirt bikes. That is what makes pit bikes perfect for passing through the pits. Pit bikes are quite convenient to drive, and their smaller sized bodies make them easy to use for younger kids. Pit bikes come with appealing aesthetics and huge handlebars whereas the dirt bikes are comparatively larger and come with proportionate handlebars. Fourthly, in case of dirt bikes, the tires have a layer of rubber on the outer surface that makes them practical for riding in dirt, mud, sand and other difficult terrains. But in case of the pit bikes, the tires do not have a rubber layer on the outer side. Therefore, pit bikes are not meant for streets and other difficult terrains. Fifthly, the quality of suspension in dirt bikes is greater than the suspension in pit bikes. Therefore, it makes dirt bikes safer and highly efficient for any difficult terrain. A suspension system is responsible for linking the wheel of the bike to its frame, and it includes shock absorbers which enable riders to drive their bikes smoothly on rough terrains. Hence, it can be concluded that pit bikes are not made for bumpy terrains! Finally, dirt bikes are costlier than that of the pit bikes. And because of this pit bikes have become popular among teenagers and younger kids. The low-cost spare parts of pit bikes make them an easy to maintain vehicle as well. However, pit bikes need require regular maintenance for ensuring consistent performance. These are a few differences between pit bikes and dirt bikes. Hope this comparison will help you in deciding on which vehicle you need for your kid. 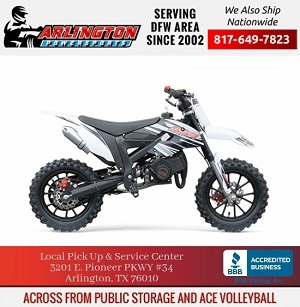 Whether you want to buy pit bike online or cheap dirt bikes for kids you can find a wide variety of options with us. All our dirt bikes and pit bikes are of high quality. For more information you can talk to us at 817.649.7823.